The biggest culprit of air and moisture leaks into your home are improperly sealed windows. Since leaky windows can cost you hundreds of dollars in lost energy, it’s best to do a visual and physical inspection of all windows in your home to identify leaks and to fix them. Here’s what you need to know about protecting your home from the elements by repairing leaky windows. One of the quickest ways to spot a leak in your window is to visually inspect them to look for obvious signs of leaks or factors that could contribute to a leak. When looking at your windows from the inside, pull up the blinds and move any curtains out of the way so that you have a clear view of the center window. Look for any gaps where air and daylight could be entering the home. You’ll also want to look at the weather stripping to ensure it’s still in good condition. If it’s not, this could be a contributing factor to leaky windows. From the exterior, look for old, peeling, or worn caulking that has opened a gap between the window and the siding. If you have single-pane windows, look for issues with the glazing. One of the first things you’ll want to do to spot leaky windows is to closely examine the windows throughout your home. The process is relatively easy and you don’t need any special supplies to determine if a leak exists. Before checking windows for leaks, be sure to fully close and lock all of the windows. This ensures a tight seal from outside elements. Even if you’re only checking windows in a certain area of your home, it’s best to close all windows to limit air flow throughout the house. The less air flow, the more accurate your physical inspection will be. To make your inspection as accurate as possible, be sure to turn off your HVAC unit. Since heating and cooling pumps air throughout the house, turning the unit off entirely minimizes airflow. Your home needs to be as still as possible, so be sure to also turn off any fans, especially ceiling fans. Once all windows in your home have been closed and all fans have been shut off, you can start the physical inspection. If you have a serious window leak, you may be able to feel the airflow by placing your hand near the window. Otherwise, you can light a candle to get a visual cue. Using a pillar candle works best so that you can safely hold it while moving it around the perimeter of the window. When the candle is near the window, if there’s a leak, the flame will flicker or smoke will start to blow away from the direction of the window. After your physical and visual inspection, if you’ve identified a leaky window in your home, you’ll want to take steps towards minimizing and eventually alleviating the leak. Ignoring a leak means that you’re wasting heating and cooling costs. The good news is that there are a few things you can do to fix a leaky window on your own. First, remove old caulk and re-apply a new line for a better seal. You can easily remove existing caulk using a putty knife. When applying caulk, be sure there’s low humidity and temperatures aren’t too cold. To fix leaky single pane windows, you can re-apply the putty that’s used to keep the window in its place. Similarly to removing caulk, you can use a putty knife to remove old dried putty. Clean the glass and then you can begin the process of re-glazing. Don’t have the time to repair windows on your own? Would you rather start with brand new windows? Window replacement is a viable option for alleviating leaky windows. Since new windows can be quite expensive, you can save money by looking online and locally for bay windows for sale that may be used or older models. 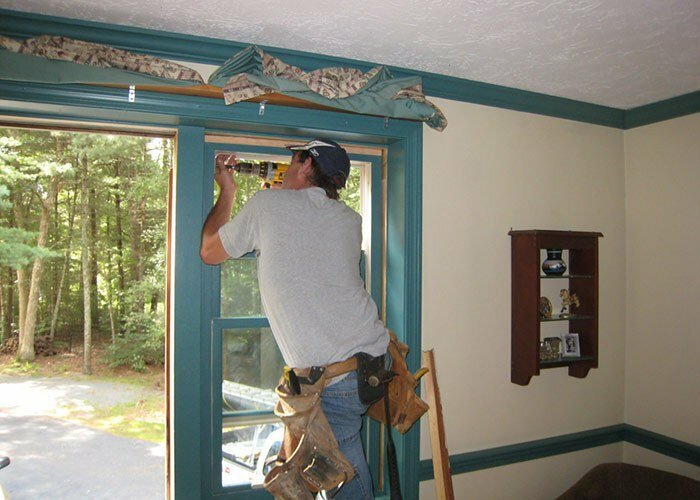 If you decide to have new windows installed, it’s also important to find a local contractor that specializes in window removal and installation. This way you’ll have peace of mind that the new windows have been properly installed and there’s no risk of leaks or other issues. There’s nothing worse than knowing your heating and cooling system is working harder because of leaky windows. Be sure to routinely physically and visually inspect your windows to pinpoint leaks so that you can fix them immediately. Was the information in this article helpful? Leave us a comment with your thoughts in the section below.